Yesterday, Ainsworth Pet Nutrition voluntarily recalled five varieties of Rachael Ray Nutrish wet cat food, due to suspected elevated amounts of Vitamin D.
There are potentially harmful side effects to cats who ingest excessive Vitamin D. It's a fat-soluble vitamin, which means it won't be flushed out of the system as easily as a water soluble one. Symptoms can include vomiting, diarrhea, muscle tremors or seizures. 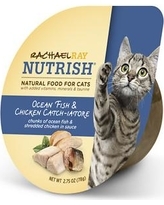 "FOR IMMEDIATE RELEASE – June 4, 2015 – Ainsworth Pet Nutrition of Meadville, PA is voluntarily recalling five varieties of Rachael Ray™ Nutrish® wet cat food, including Ocean Fish-a-licious, Lip Smackin’ Sardine & Mackerel, Ocean Fish & Chicken Catch-iatore, Tuna Purrfection, and certain lot codes of Paw Lickin’ Chicken & Liver due to potentially elevated levels of vitamin D.
Two variety packs that contain some of these recalled products (the Chicken Lovers Variety Pack, and the Ocean Lovers Variety Pack) will also be recalled. The recalled products are distributed nationwide. No other Rachael Ray™ Nutrish® products are affected by this recall." Some of you may recall our article in 2014, when Faraday had several teeth removed due to tooth resorption. I wrote an article on it back then, and again for Catster late last year. One theory behind this links excessive levels of Vitamin D in wet cat food to the disease. This is another reason to take a careful look at any cans you may have purchased! Humans can rid themselves of extra D. I guess we can’t.